Our National Advocacy Director Josh Ruebner was interviewed about the recent letter sent by 15 prominent church leaders to Members of Congress regarding U.S. military aid to Israel. The letter decried “widespread Israeli human rights violations committed against Palestinians" and called for “an immediate investigation into possible violations by Israel of the U.S. Foreign Assistance Act and the U.S. Arms Export Control Act” and for the “withholding of military aid for non-compliance” with these laws. Thank the church leaders for their important letter. After pulling out of an interfaith dialogue conference, several Jewish groups stepped up their attacks on the Christian leaders, accusing them of bias against Israel and even of anti-Semitism. The letter was sent to Congress by leaders of such prominent Protestant denominations as the Presbyterians, Methodists, United Church of Christ and the National Council of Churches (USA), among others. Abrams, like the more mainstream Jewish groups, sees the letter as motivated by hostility toward Israel. Like them, he does not engage directly with the substance of the letter, nor does he answer the charges of systematic human rights abuses by Israel, but instead raises questions not directly related to the letter’s content to support his contention that the letter is motivated by anti-Israel malice. 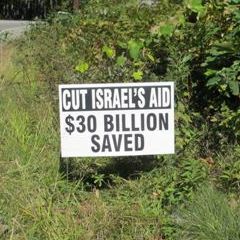 And, while Abrams is surely correct in asserting that “It is unlikely that the churches’ letter will affect the level of aid to Israel,” he does not explain why, if that is the case, such a wide spectrum of the Jewish community has reacted so strongly to it. The centrist J Street was just as critical as Abrams, though with a far more conciliatory tone. In an op-ed on Newsweek’s Daily Beast web site, the vice president of their education fund, Rachel Lerner wrote: “J Street opposes proposals to condition or cut security assistance to Israel…As with so many efforts to address this complex situation, the letter fails to weigh criticism of Israel’s behavior with appropriate criticism of, for instance, rocket fire from Gaza into Israeli civilian areas. These specifics were cited by Abrams, the JCPA and the ADL as well. But the letter asks not for a cut or conditioning of aid, but a review of whether that aid is being given in compliance with U.S. law, something that has been done frequently with U.S. foreign aid. The letter also makes several mentions of Israeli hardships, specifically rockets fired from Gaza, and consistently equates Israeli and Palestinian suffering. “Over the years, a number of members of Congress have asked the State Department to report on whether specific incidents constituted violations of the Arms Export Control Act, Foreign Assistance Act or other U.S. laws by Israel,” Joshua Ruebner, the National Advocacy Director of the U.S. Campaign to End the Israeli Occupation, told IPS.